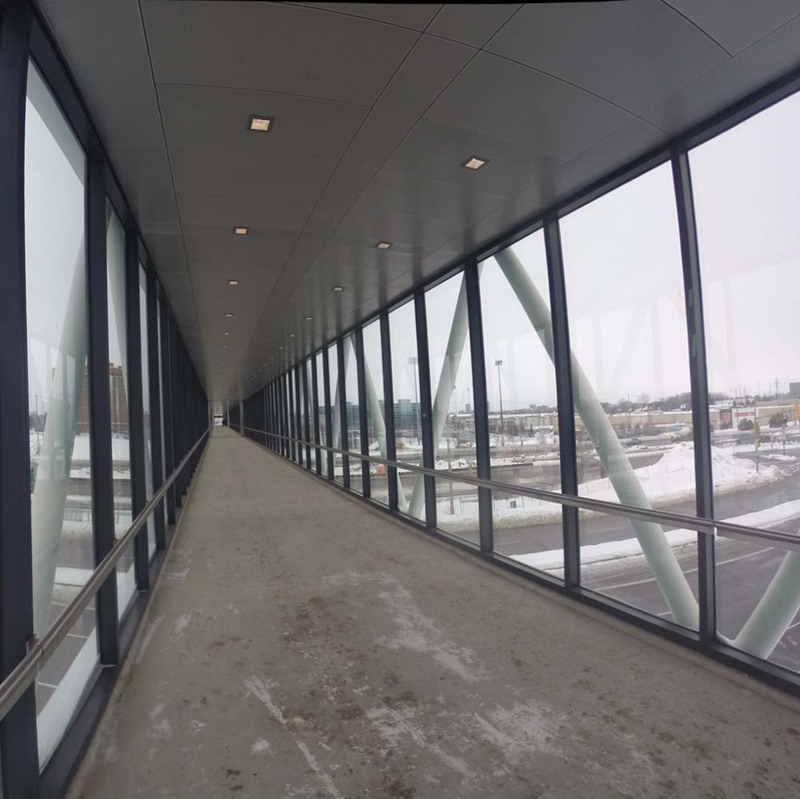 The Coventry Pedestrian and Cycling Bridge over the Queensway links the Ottawa train station to a semi-professional baseball stadium, but more importantly facilitates a traverse across the Queensway highway, the most predominant north/south barrier that stretches the width of the city. The following video captures the hasty termination of the oficial launch as it quickly wound down due to cold weather (-14ºC not including wind chill) I filmed the following traverse heading north over the bridge, and down the ramp on the other side to the edge of the stadium. The following map describes my ride to the event from Centretown (blue line) and back (purple line). The blue cyclist emoji is where the momentous occasion unfolded. Ottawa is very fortunate to have a wonderful arboretum quite close to Centretown, located between the Rideau Canal to the east and Prince of Wales Drive to the west. 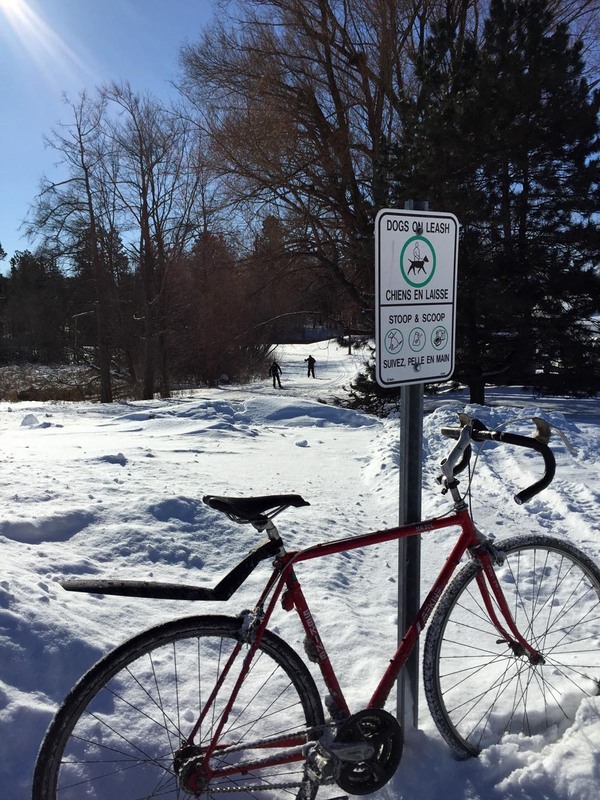 A four kilometre machine groomed cross-country ski trail that runs through it has recently been prepared for the annual Winterlude Triathlon. 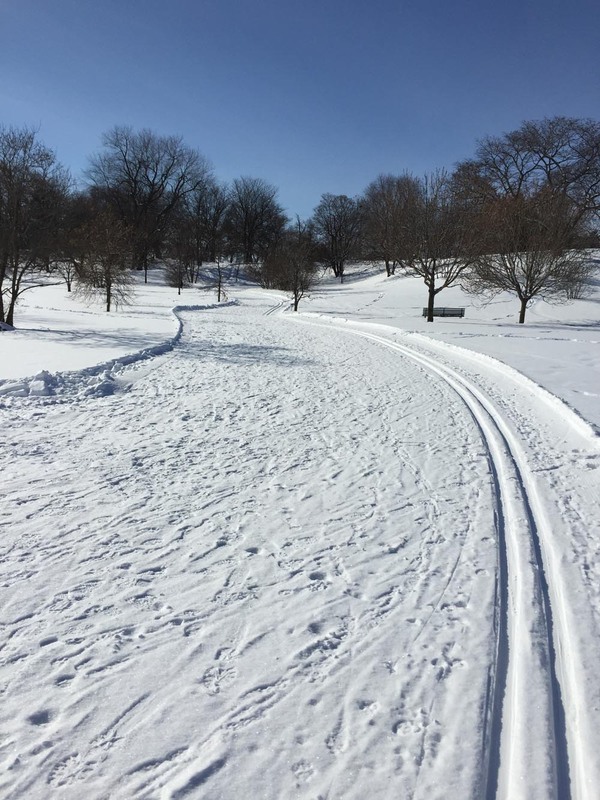 Normally the breaking in of ski trails is left to intrepid skiers, as described in my first post on Biking to and Skiing Through the Arboretum. This modus operandi will most likely return once the next significant snow fall occurs, however until then it is definitely worth taking advantage of the groomed trail, identified by the purple line on the map below. 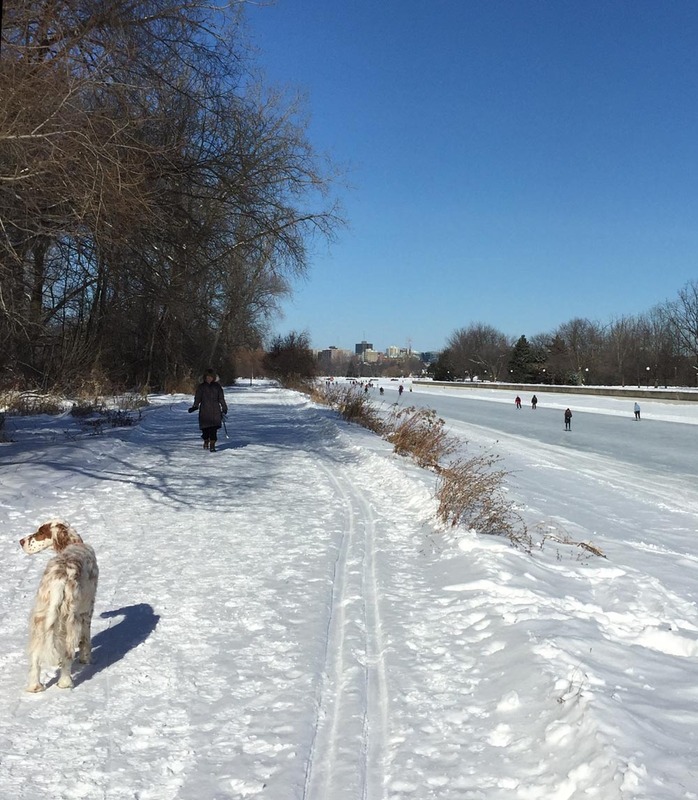 Accessing the arboretum from the edge of Dows Lake is a fine way to get to the trail. The blue line on the map is a suggested bike route to get there from Centretown. Here’s how it goes. Our adventure begins near the corner of Somerset and Cambridge. I bundled my skis and poles into a ski bag, strapped them to the side of my hiking backpack, and headed out. 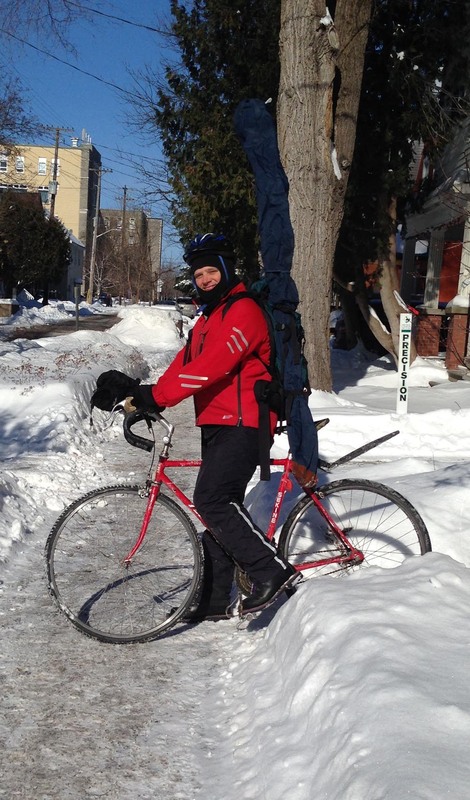 I rode along quiet streets towards Dow’s Lake, crossing busy Gladstone at the traffic lights at Arthur Street. On the opposite side of Gladstone I continued down Arthur Lane. To get beyond the Queensway I turned on to Booth Street from Arlington. As Booth is one of the few roads that goes under the Queensway it can get busy, particularly during the week. 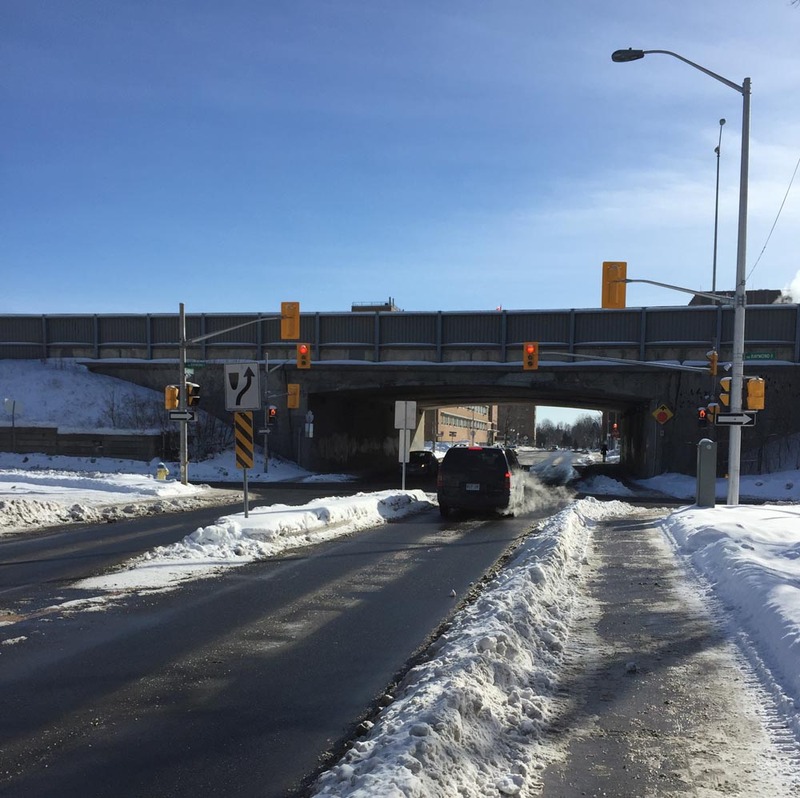 A meridian has recently been added to the middle of the road along Booth just north of the Queensway underpass, narrowing the lane at this pinch point. If traffic is heavy I may choose to take to the sidewalk along Booth between Arlington to Raymond Street. This Sunday it wasn’t so bad. Booth Street widens once again beyond the intersection at Raymond as it heads under the Queensway. At the north end of Booth there are traffic lights to help get across busy Carling Avenue. 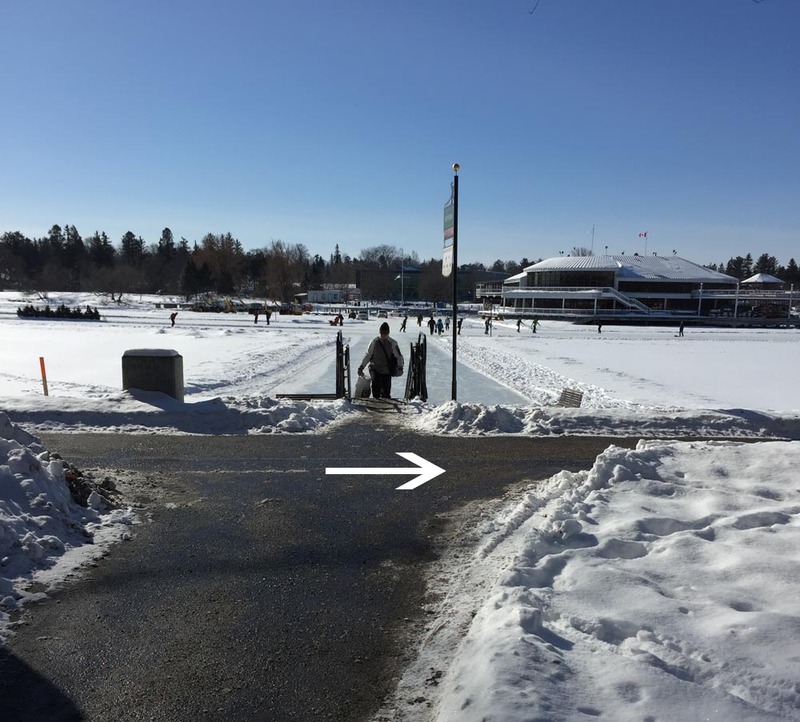 On the other side of Carling there is a plowed path that cuts through Commissioner’s Park to the Queen Elizabeth Driveway. 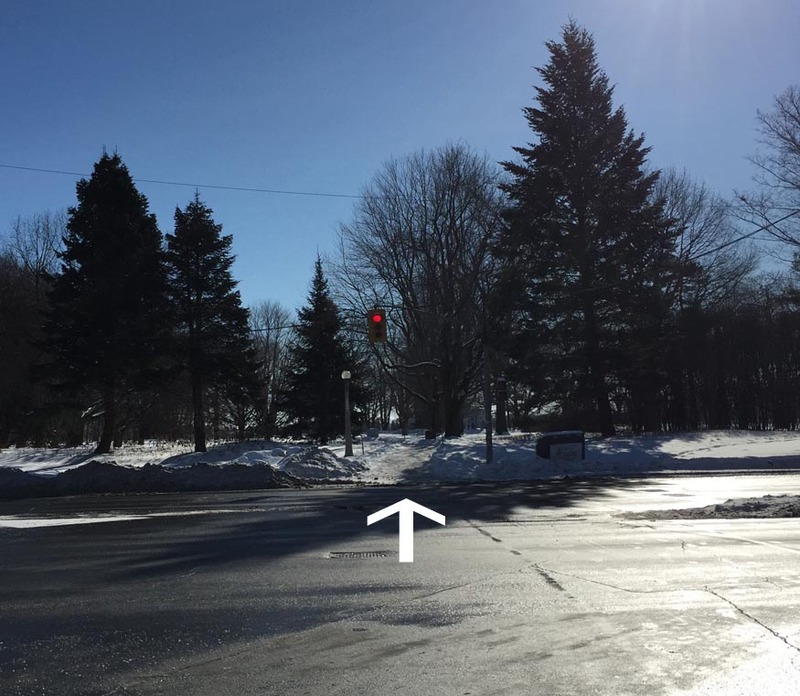 There aren’t any traffic signals to help get across the Driveway to the Rideau Canal Western Pathway so watch out as drivers tend to speed along this stretch. 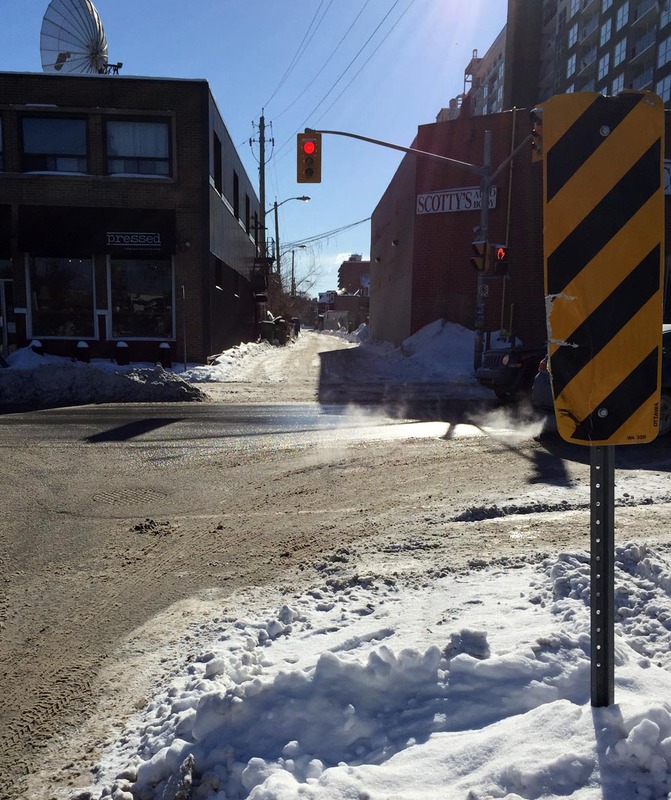 It’s a much calmer crossing on Winterlude weekends when they close the Driveway for all vehicles except OC Transpo shuttle buses. I then rode along the Rideau Canal Western Pathway, which is cleared throughout the winter, to the Dow’s Lake Pavilion. To get to the groomed ski trail I took the well travelled path just to the right of the Dow’s Lake service ramp. If this path proves to be inaccessible by bike, I would lock my bike to a post or canal railing near the pavilion and ski in from this location, however on this occaision I had no difficulty getting through. I then locked my bike to this sign post a short distance further along the path, right where the groomed trail passes by. I’ve found this to be a fine spot to access the Arboretum to go skiing, even without a machine groomed trail as most often another skier has already arrived ahead of me, although early one morning after a big snowfall my daughter and I took the lead and broke trail, which can be exciting too. The trail winds through the arboretum like so. One of the joys of the arboretum in the winter is seeing the varied mix of users, making it a veritable winter playground. On a typical outing one may expect to come across snow shoers, skiers, tobogganers, skaters along the canal, fellow cyclists and dog walkers. 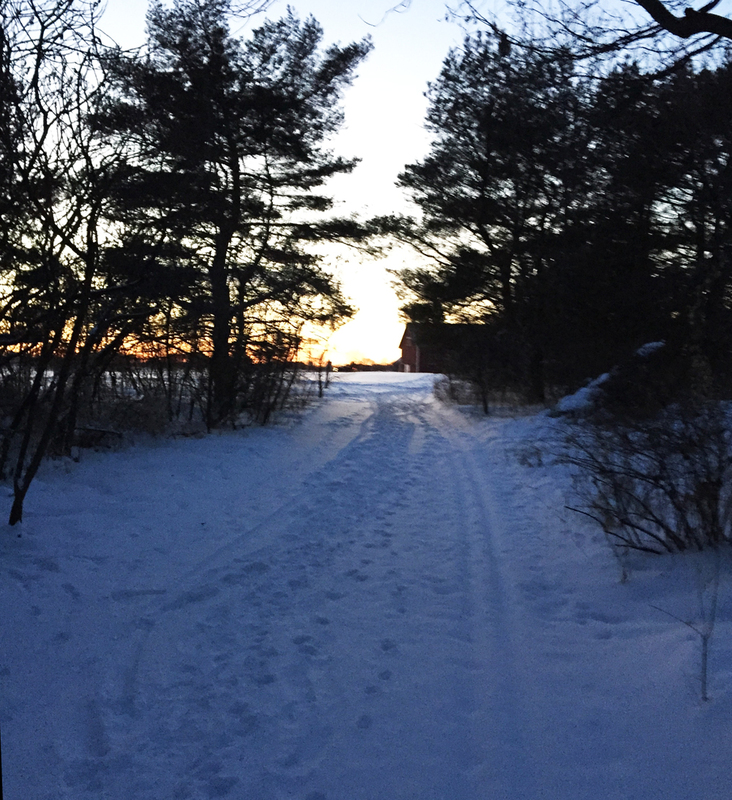 UPDATE– February 2nd: It snowed a few centimetres last night, making the trail less groomed but discernible. Someone had ridden a Fat Bike along the packed skate ski portion of the trail which must have been fun. Portions of the trail run along paths popular with dog walkers, but the classic ski tracks are off to the side. I hope to revisit the route throughout the winter. Definitely worth it.